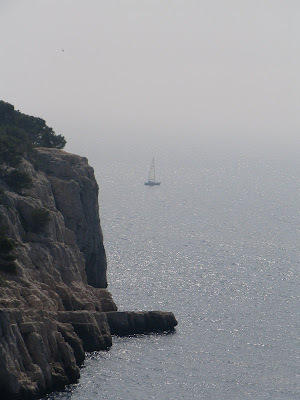 As my Harlaxton semester was coming to an end, I took a week off from school to travel near Marseilles, France. Katrina, studying in France this semester, had Spring Break during that week, so it felt like the perfect opportunity to explore the French Mediterranean coast. I arrived to Marseilles on Monday evening, taking a bus from the airport and meeting Katrina at the bus station. Though the airport was situated only about 15 miles away from the city’s centre, I actually quite enjoyed the drive - watching the sea and the nearby hills reflecting the sun's last setting rays, and marveling at the odd mix of new villas and old ruins clustered side-by-side once we entered the city. I met Katrina at the train station, and together we took a train to the nearby village of Cassis (some 20 minutes away), where we planned to spend the next several nights at a campsite. We arrived at Cassis in near-perfect darkness. After getting directions to the campsite, misunderstanding them, and walking about the deserted streets of outer Cassis for half an hour, we finally came upon a helpful sign that directed us to our destination. The campsite turned out to be a rather "civilized" site with bathrooms, showers (and even - albeit rather fickle - hot water), rather small camping plots, and far too many people with their accompanying RVs and cars. The site was quite clean and safe, however, and it proved to be situated in a reasonably convenient location (especially since no other campsite exists in the Marseille area, and it is illegal to pitch a tent outside a campsite). Upon arriving, Kat and I sat up our tent -- a newly-purchased 20-euro wonder that was well-built, pretty convenient, portable, and (as we found on the following day) totally rainproof. We spread out a rugged tarp underneath it, and later hung a lighter tarp above the entrance so as to create a rainproof shelter where we could place our wet clothing to dry. For lack of any cords or strings to hang the tarp, I used industrial-strength dental floss to hold everything together. All that done, Kat and I put our stuff inside the tent, laid out our sleeping pads and sleeping bags, folded clothing for pillows, and stopped for a moment to admire our work. Up until now, we had worn headlamps to assist us in setting up our camp, but now, inside the tent, I took Katrina's headlamp and hung it from the tent's ceiling to create a chandelier! "Our home" were the first words on our lips; and it indeed felt quite wonderful to have such a cozy, shiny, and lighted -- albeit tiny -- home of our own. In the morning, before we set out to the sea, Katrina decided that it was time to cut my hair. It's been over a year since I had it cut before last spring break, and we had talked about Katrina cutting my hair for quite some time; but now, endowed with scissors that she had specifically bought for the occasion, Katrina felt inspired to cut my hair on that very day. She had never cut anyone's hair before, but we both figured that it should be a relatively easy task with my curly hair. As a disclaimer, Katrina did tell me a long story about her scissors: how they once were magical and could cut any hair beautifully by themselves, but then, to save a repenting monster, she had to benevolently sacrifice the scissors' magical powers, rendering the scissors only as good as the skills of their user. Now that those skills were called upon, Katrina encouragingly told me that she wasn't going to see me for another six weeks after this trip, and by that point my curly hair would hopefully remedy any glaring errors (as a bonus, my messed-up hair would deter any girl from being attracted to me in the meantime). All that said, and despite reassuring exclamations of "oh my gosh, why are you letting me do this to your hair? ", "What have I done? I’ve mutilated your head", and etc, my hair actually turned out quite nice, and I'm very satisfied with the way it now looks. 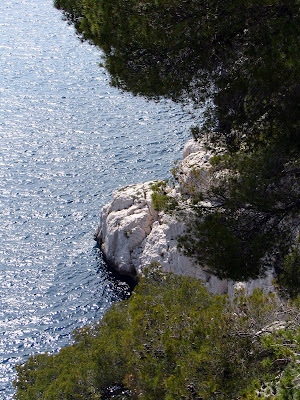 Mission accomplished, Kat and I got directions to the famous Calanques -- Mediterranean fjords, surrounded on either side by towering limestone cliffs -- that run from Cassis to Marseilles. The trailhead began on the other side of town, some 45 minutes away. To get there, we walked through the quiet sloping streets of Cassis, marveling at the town's beauty and elegance along the way. From remarkably clean streets, to gorgeous stone houses with arches and vibrant color schemes, to beautiful green pines (and the smell thereof) surrounding every house, to breathtaking views of the Mediterranean from nearly every corner, the town was the very model of idyllic European-Mediterranean life. The trails were likewise clean and well-kept, and the views were marvelous: steep white cliffs and trees on one side of the trail, and green vegetation and the sea on the other side. Though calm, the sea was still producing some waves, which would then rupture beautifully upon the rocky cliffs surrounding the fjords. 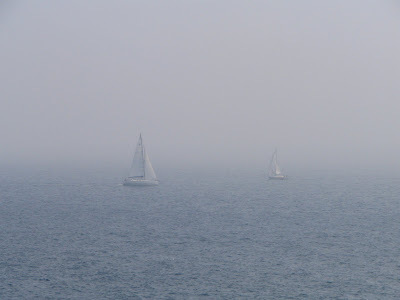 There were quite a few vessels upon on the sea -- both small sail boats and motorized boats of all sizes -- but most were not too obtrusive to the scenery. The main trail was fairly popular with hikers, but just several minutes off of the main trail led to secluded spots with pure scenery and pines and flowers. And then there was the sea -- the beautiful, azure Mediterranean Sea, gracefully stretching towards the endless misty horizon. The first fjord, right next to the parking lot and cluttered by countless docked ships, offered no particularly spectacular views, but the second and third fjords were so beautiful that Kat and I spent the majority of our next several days there. The second fjord also had a reasonably pretty beach at its side, though on that first day it was filled with 2-3 dozen people, so we chose to keep hiking instead of swimming there. We came to a prominent rock that was sticking right outside the fjord into the ocean, effectively separating the second and third fjords, and decided to take a lunch break there. The weather up until now had been perfectly sunny, despite some clouds lurking on the edges of the surrounding mountains -- so sunny, in fact, that sitting on the rock in plain sunlight became too unbearably hot for me. After some cajoling of the rather unwilling and content-as-is Kat, I managed to convince her to join me in the shade, out of the sun... and then all hell broke loose. Actually, ALL hell breaking loose might be an exaggeration; the only part that we were actively aware of breaking was the part in charge of the weather. The sun, indignant at this ungrateful Alaskan boy, jumped behind the clouds to give me a taste of what life is like without it; within five minutes, heavy rain was pounding on my shady tree. The pine trees, covered in thin needles instead of proper leaves, proved to be of little shelter against the rain. Stunned at first, we rushed to pack our spread-out food and camera into Kat's waterproof backpack; seeing that the clouds were not going to clear despite my sincerest apologies to the sun, we started heading back. The rain continued to pursue us on and off all along our return, alternating between harmless sprinkling and heavy-duty pouring. By the time we got back to the beach, there was no one there except a family of fishermen, standing off to the side. On an odd whim of defiance towards the rain, Kat and I decided to take a swim. The water seemed warm enough when I stuck my hand in it, but perhaps only in comparison to my cold hand; when we changed into our swimming gear and rushed into the water, our brave charge turned into a near-immediate retreat out of the frigid sea. Upon emerging back out of the water, the wind and rain did not make the experience any more pleasant. I'm sad to say that it was our only attempt at swimming throughout this whole trip, and it's unfortunate that we chose such an inopportune moment; we still are nurturing hopes of swimming in Corsica in May, though! The rain that day and on the following night was the only rain we encountered during our stay in Marseille; the rest of our days were sun-filled and gorgeous. On the second day of our stay, Kat and I ventured to explore the strip of land between the first and second fjord. Once again the water presented us with a beautiful vision of ever-shifting patches of sunlit sapphire contrasting with speckles of darker turquoise riding the waves. We also discovered a number of "breathing holes", where waves underneath the rocks pressured air in and out of a openings far above the water. [A day later, in fact, we found one such hole some 60 feet above water, with air pressure strong enough to lift a pine cone several inches up in the air, to my endless amusement]. We also came across some stone arches and walls leading towards the ocean -- our best guess is that this was once a port, and that the descending stone walls and floors were formerly used to roll barrels of goods into ships. As the evening approached, we sat on the very western edge of the cliff and watched waves dash against an island-like rock nearby (also observing hazy outlines of two real islands several miles away). From our cliff, we also enjoyed a wonderful view of the gradually-lowering sun casting colorful shadows upon the restless sea. 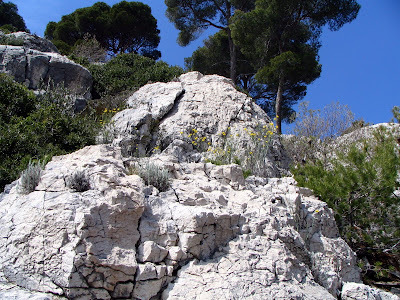 The third day began with my foolish idea to explore a chateau atop a hill in Cassis. I had thought that the chateau would be an open-to-the-public sort of castle, but it turned out to be decisively privately-owned. 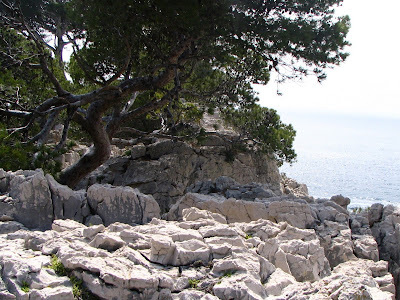 We spent an hour meandering through dead-end streets of a commercial district of Cassis to establish this point, and then another half-an-hour walking along a littered and abandoned trail before getting back to the trailhead of our familiar and beautiful Calanques. 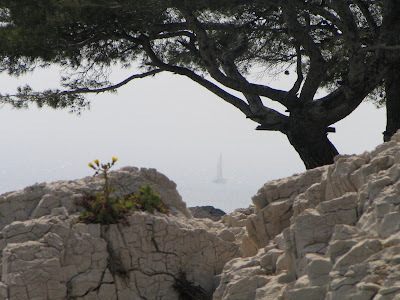 But the Calanques once again rewarded their unfaithful travelers with astounding beauty. Kat and I went on the same strip of land as on the previous day, but this time we stayed on the side of the second fjord. We retreated to an isolated area where water kept gently splashing upon the rocks, and then climbed down towards the very sea level to dip our legs in the water, standing on a just-barely-submerged rocky platform. As we stood in the water, a tiny octopus swam onto our platform for a couple of seconds before being washed away by a wave: so natural and beautiful was the world! The water's surface glimmered beautifully in the sunlight, and, like on the previous night, we stayed on those rocks until the sun disappeared behind a mountain. The following day we hiked for a shorter while, as we had to get back to the campsite early to pack for Kat's early-morning train on the next day. Non-the-less, we walked farther than at any other time, going all the way to the third fjord. We tried to rent out a kayak in the morning, but the kayak-renting place ended up being closed; for a moment we did consider buying an inflatable boat, but after some deep thought we figured that a 20-euro inflatable raft was probably ill-equipped to brave the Mediterranean waters. So we hiked instead, and then did a bit of tricky rock climbing to compensate for the safe choice of not buying the boat in the morning. The hike was still wonderful, however, and when we got back to the campsite in the evening, it was sad to pack all of our stuff and to have to head back to our respective campuses after such a lovely jaunt to the French Mediterranean Coast. I walked with Kat to the train station on the following morning, and then returned back to the campsite. I finished packing and checked out of the campsite, but I still had four hours before my train. 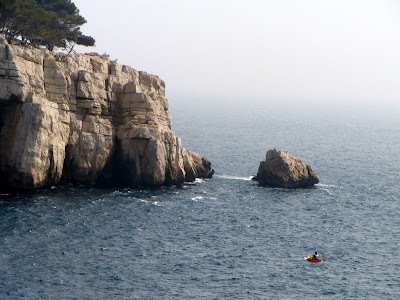 I had planned to use those four hours to once again visit the nearby Calanques, but my heavy backpack (loaded with a tent, two tarps, a sleeping bag, a sleeping pad, all my clothing for the week, and some miscellaneous items) did not seem too conducive for a quick run to the shore. Fortunately, as I stood in line to check out and pay for our stay, I heard some people talking in Russian behind me. They were Russian immigrants currently living in Grenoble, France (same city as Katrina), who came to Marseilles for the weekend, and were now standing in line to check IN to the site. 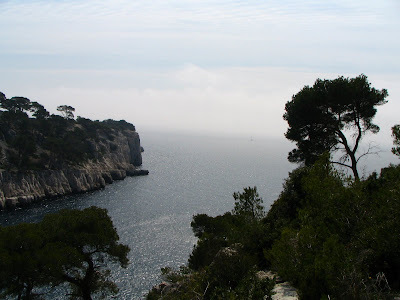 They kindly allowed me to leave my backpack next to their tents, and, as they themselves were heading to the Calanques, they invited me to follow along. With a feeling of an expert tour guide I helped them find directions to the trailhead, and then joined them on their walk. We hiked to the same prominent rock that Katrina and I came to on the first day, and then took a break for lunch. My wonderful hiking companions, bestowed by the excellent Russian traits of hospitality and of always carrying extra food with them, shared some of that food with me. The meal was most excellent, both for its unexpectedness, its wholesomeness, and -- pardon me, my dear Katrina -- for its non-vegetarian-ness. After lunch I parted with my hosts, who were to continue hiking for another several hours, and hurried back to the campsite. Within two hours I was at the train station, within two more hours I was at the airport, and within two additional hours I was in England. 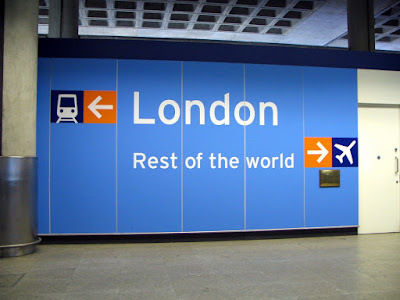 After spending the night at the airport, I took a train back to Harlaxton -- but not before I saw a wonderful painted sign at the Stanstead Airport, which matched so perfectly with a British Studies that I missed while in Marseilles: Britain's island mentality and isolation (see image below).